Nanda Devi National Park is situated in Chamoli district of Uttaranchal. The spectacular panoramas of peaks encircling the National Park are Trishul (7120 mt.) Dunagiri (7066 mt.) Nanda Devi (7817 mt.) Nanda Devi East (7430 mt.) Bethartoli (6352 mt.) etc. The beautiful surroundings with abundant flora and fauna like Brahma-Kamal and Bharal (blue mountain goat) make this a sanctuary of nature. In 1982 access to trekkers into the Nanda Devi National Park was banned to protect its biodiversity. The Nanda Devi National Park, which has been declared a world heritage site, has been partially opened recently for restricted number of tourist. Sir Edmund Hillary, in his autobiography, has described that the "Nanda Devi Sanctuary is God-gifted wilderness-India's-training ground for adventure"
From Rishikesh to Joshimath is a 253 kms drive followed by a further drive of 25 kms to the road head at Lata village where the trek begins. The park will remain open for a period of six months from 1st May and close on 31st October. The visitors will move in groups. Each group will consist of maximum of five visitors. Not more than two groups are permitted in one day and not more than four groups will be permitted in one week. One registered guide will accompany every five visitors. Visitors only above 14 years will be allowed to go inside the park. It will be mandatory for all the tourists to obey and observe all the provisions of wildlife protection act inside the park area. However, since the terrain is hilly and arduous, a visitor should get himself medically checked and should take all precautionary measures on his own. 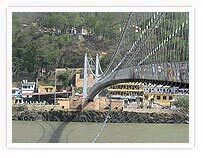 Rishikesh (340 m) Joshimath (1890m) 253 kms drive After breakfast drive to Joshimath 253 kms. Lunch in route Overnight TRH Joshimath. 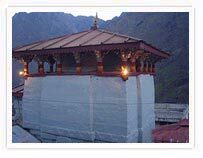 Joshimath to Badrinath (45 Kms 3 hours drive) This is one major shrine among four major shrine in this region. This is the border area and this Mana Pass was famous for trading in ancient trading between Tibet and India. Joshimath Lata Road Head (2000 m) Lata village (2317 m) 25 kms drive to Lata village road head and 1.5 km trek to Lata village This is the last human habitation on our trekking route. Trekking would be given on exposure with the unique culture and customs of the region. Visit Lata village and the famous Nanda Devi temple. Overnight in village. Lata village Lata Kharak (3689 m) 8.5 kms trek The first day of the trek is probably the toughest and involves a steep ascent of almost 1524 m with a break at Belta. 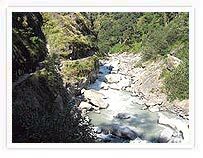 Today's trek can be anything from 6 to 10 hours depending upon the individual trekkers. However it is an excellent beginning from the point of view of acclimatization. The camp/hut at Lata Kharak is situated on the height of 3689m and high plateau surrounded by towering rocky Pinnacles. Overnight in Hut/tent. Lata Kharak Jhandi Dhar Bagfyana Satkul Dharansi Pass (4250 m) 10 kms trek Wake up at down to breath taking view of Mount Bithartoli-Himal (6354 m), Nanda Ghunti (6309 m), Ranthi Peak (6003 m) Dronagiri (7066 m) and the vast view of Kunwari pass, Auli, Urgam Valley and Lata Village. After breakfast trek begins with a steep climb up to Jhandi Dhar and further up to Bagfyana pass. From Bagfyana the trail posses through a very narrow gorge of Satkula with steep ascents and descents and finally one arrive at the meadows of Dharansi pass where we stop for the overnight near the water point. Overnight in tents. Dharansi Pass Debrugheta (3500 m) and back to Dharansi Pass 14 kms trek Like the inner sanctuary, the prominent Malthuni-Bethartoli ridge, between Dharansi Pass and Debrugheta, also divides the outer sanctuary. Both these ridges from magnificent Pass to Rani Kholi and up to Donidhar is a gradual descent and then from Donidhar to Debrugheta is a steep descent of 750 m till one cross the improvised bridge over the stream. Afternoon return trek to Dharansi Pass. Overnight in tent. Dharansi Pass (4250 m), Satkula, Bagfyana, Jhandi Dhar, Hitoli Campsite 12 kms trek Return trek up to Jhandi Dhar of about 7.5 kms and further steep descent of 4,5 kms, through the rich forest of Rhododendron, Birch and Raga fur. Overnight in tents at Hitoli campsite. 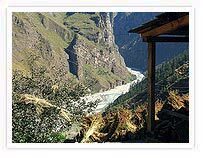 Hitoli Campsite, Tolma village, Surai Thotha (2161 m) road head, Joshimath 8 kms trek and 30 kms drive Ater breakfast 5 kms trek down to Tolma village through the rich forest ot Thuner, Kail, Ddevdar and Surai. Then further trek down 3 kms to road head Surai Thotha. Drive to Joshimath 30 kms. Overnight in TRH Joshimath. Joshimath Haridwar 273 kms drive After breakfast to Rishikesh 253 kms. Lunch enroute. On arrival Rishikesh tour/trek concludes. Note :- Itinerary will be strictly adhered to as per guidelines laid down by Nanda Devi National Park authorities.